The fabric of the dress is good and the lace details at the sleeves are nice (I have a weakness for lace). Strapless bras are a must as the straps of the bra can be seen .The dress fits me well. Although the material is stretchy, I think the dress can only fit up to big UK 8. The only gripe is that the dress is too short for me. For girls who are above 1.6m and who do not like short dresses, this dress may not be suitable for them. For your reference, the one in white on the right is the piece I tried in KJ, Size S.
Tried this at KJ previously and was quite tempted to get it cause this would be a nice skater dress. . So I camped for the launch and got the dress on thursday (2 days later), which was real quick! But the dress was quite a disappointment as it was nothing like those displayed at KJ. Firstly, the material was thinner than the one at KJ. But this factor didnt bother me so much as our weather is quite humid, so I'm okay with the thinner material. 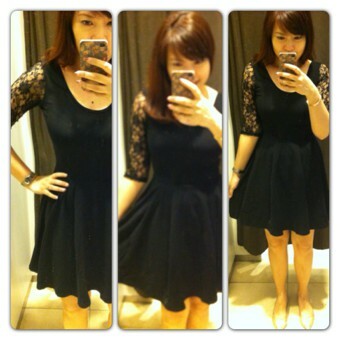 Secondly, the cutting of the dress was different from the one at KJ. Size S is quite tight for me but size M is way too loose for me for the pieces at KJ. But I thought since cotton would expand after some time, I took S during the online launch. And it was a really good decision! This piece, S, fits me well with allowance and is nothing like the S I tried at KJ. You can compare from the pictures above. .
Well, despite all these negative remarks cause of the differences between the pieces between the online launch and the one with KJ, this is still a very nice dress. The only thing to take note is the sizing and the length of the dress. 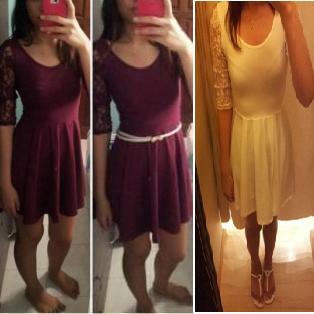 If you are above 1.6m and dont enjoy wearing short dresses, then I would not recommend it. Otherwise, it is still a very versatile piece. For $28, it is still a good buy! FYI, I'm a UK6-8, 165cm. Mine came with a small hole at the end of one of the lace sleeves, but this is a small problem because it's very near the edge so it's totally not obvious(: But as I was trying on the dress today I accidentally tore a small bit of the lace at the armpit area of my left arm:( I'm quite thankful that at least its at the armpit area, so If I don't lift my arms up you don't see the mini holes.haha. However I'll be selling this dress as I feel that my arm movements are too huge for this delicate dress.haha. I'm selling it at $15 if anyone is interested, but please do note of the defects I've stated above. if you're interested email me at rhythm_of_luv@live.com! It was love at first sight with this dress when I first spot Veronica reviewing this here. it looks so simple yet classy. Explains why many babes already reviewed it here! I was afraid that the lace may be too flimsy but it was acceptable enough. The dress was smooth n stretchy. I was under strong light when trying and i find the dress very slightly sheer.. Length was good as well. It's an oh so comfy dress to be in yet classy. I love the low back as well. The only issue is prolly being black it will be subject to lots of furring I guess and the lace got to be handled with loads of tender loving care. 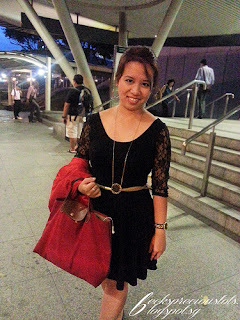 Here's a review of TVD Lace Sleeve Skater Dress in Black. 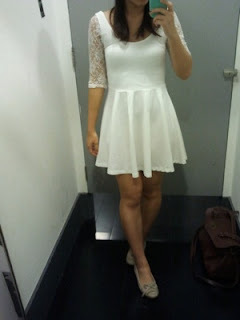 It's a really simple, basic dress that was a MUST-GET for me. I heart anything lace. The sleeves add style and femininity to a basic dress and I love the low scoop back. The dress will fur after sometime and because of it's weight, the dress will become longer. It is advisable to lay it flat after washing. You must be careful not to hook your sleeves onto anything as it's quite fragile. 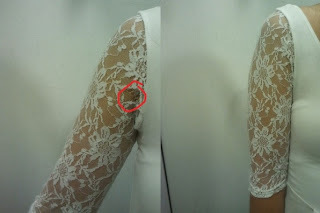 I thought the workmanship of the lace sleeves wasn't fantastic though especially at the part where they stitched the sleeves together to prevent it from having any loose thread.